Are you the type of person who has big ideas of how their next paint job will turn out and imagines the finishing product looking perfect and looking crisp? Only to have it all ruined at the last minute by second grade tapes, which bleed or leave tiny pieces of tape behind and you're up all night cleaning it off with a putty knife? Blue Rhino's got your back! * Creating a 14 day clean removable crepe paper, made for the harsh Australian outdoor conditions. * Making it residue free and able to stick to curved walls, wallpaper, wood trim, glass and metal, while still be sensitive enough not to damage existing wall surfaces. * Giving the consumers confidence that they are purchasing a product that comes with a No Bull 100% Money Back Guarantee. If the product does not meet any of the mentioned criteria a full refund will be given. So what are you waiting for? 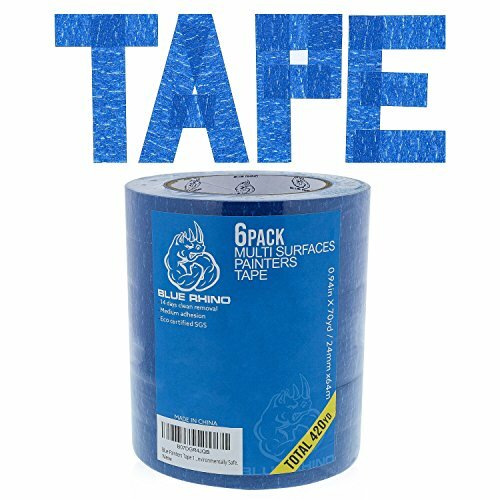 Start your next home improvement project with a must have painting accessory, whether that be re-modelling your kitchen or adding an extra bathroom tackle it with Blue Rhino on your side Order Now! ✔️ MEDIUM ADHESION WITH NO RESIDUE - Sticks to curved painted walls, wallpaper, wood trim, glass and metal. Gives you a beautiful finish with sharp and clean lines with no bleeding. ✔️ GUARANTEED NOT TO TEAR! - We stand behind the quality of our product and should you ever have an issue with tape tearing when trying to peel it off the roll, we will replace it 100% free of charge. ✔️ PREMIUM QUALITY PRO PAINTERS TAPE - UV, heat and light resistant ideal house painting supplies for indoor and outdoor use. ✔️ GENEROUS SIZING - Be confident in tackling the larger size house projects with our extra long 70 yard, six roll contractors pack. ✔️ ECO FRIENDLY - Our Manufacturer is Eco Certified SGS. We are proud to be the only 0.94 inch Eco Friendly Certified painters tape on the marker. If you have any questions about this product by Blue Rhino, contact us by completing and submitting the form below. If you are looking for a specif part number, please include it with your message.